A full employment bill – sort of! You know something is wrong when the unemployment rate in major holiday destinations persist at high levels. Typically, these areas have what economists refer to as seasonal unemployment – so that during the off-season (when the holiday makers are back home) there is very little labour market activity but once the vacation period begins there are many jobs and people. I have lived in various surf locations for many years and one such location had a steady-state population of 1000 or so residents and on Boxing Day this swelled to 25,000 and that new population endured for the ensuing holiday period (until the Australia Day weekend – January 26). Many of the surf crew and musicians would take jobs during this period and work very long hours (the surf was typically bad during the summer anyway) and use the savings to eke out an existence for the rest of the year – sometimes also accessing unemployment benefits sometimes not. The US Bureau of Labor Statistics published a bulletin (September 7, 2010) for the Cape Cod area which is one such major holiday region in the US. The situation there is dire and requires an immediate policy response from the US government. Unfortunately, this issue appears to be off the policy agenda. Well, until this week at least. A Democrat from Ohio has introduced a “full employment bill” which aims to eliminate the US central bank (good) and restore the US government’s currency sovereignty for keeps. The problem is that it goes down some dead-ends and avoids facing up to the real issues. So it is a well-motivated full employment bill – sort of! 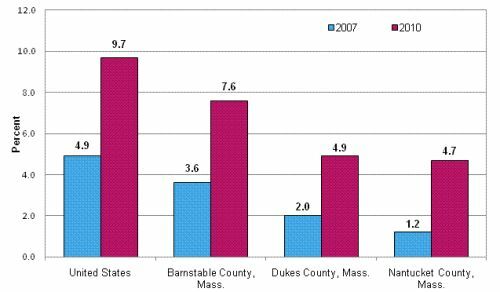 Barnstable, Dukes, and Nantucket Counties all had unemployment rates that were higher in July 2010 than one year earlier. Dukes County posted the largest over-the-year increase at 1.2 percentage points; Barnstable and Nantucket counties had increases of 1.0 and 0.8 percentage points, respectively. The national unemployment rate was unchanged over this same time period … Cape Cod and the Islands have experienced appreciable unemployment rate increases over the last three years … By July 2010, jobless rates had more than doubled in both Barnstable (up 4.0 percentage points) and Dukes (up 2.9 points) Counties, while almost quadrupling in Nantucket (up 3.5 points). Nationwide, the unemployment rate nearly doubled from July 2007 to July 2010, rising 4.8 percentage points. The following graph described in the publication as “Chart 1. Unemployment rates for the United States and counties comprising Cape Cod and the Islands July 2007 and July 2010, not seasonally adjusted” presents a comparison between July 2007 and July 2010 for these Cape Code countries. The message is clear – if the seasonal spending associated with vacations is insufficient to stimulate the local labour market then something is seriously wrong with the economy. According to US BLS data, as at November 2010, there were 15.119 million US workers unemployed and 13.3 million so-called marginal and underemployed workers (that is, according to the BLS U6 category). These are the underemployed or hidden unemployed. They would take more hours or a job if it was offered. The reality is that in a functional sense – that is, in assessing the potential productive labour supply – the marginal workers are no different to the officially “unemployed” workers. If demand for labour increased both pools of idle labour could be drawn upon to take the jobs. The following graph shows the evolution of the official unemployment rate and the U6 BLS measure – Alternative measure of labor underutilization U-6 – which is defined as “Total unemployed, plus all marginally attached workers plus total employed part time for economic reasons, as a percent of all civilian labor force plus all marginally attached workers” since 1994 (when the U6 measure was first published). The gap between the two series varies little which means that the threshold between the labour force and marginal status is highly cyclical. The situation that is presented by this data is dire and should ring alarm bells in every politicians office in America. I get the impression, however, that the polity is more concerned with other issues – like status of minorities in the armed forces. Before I get a torrent of hate mail accusing me of being anti-gay let it be known that I am not. That issue is very important but in my view is not of the same sense of priority as the unemployment disaster – just my value judgement. As an aside, if I was legislating about membership of the armed forces in the US I would make it illegal for a heterosexual to be in the forces. That should cut down a bit of destructive global activity! The historical record suggests (certainly during the Great Depression) that job relief programs that various governments have implemented to try to attenuate the massive rise in unemployment were very beneficial in terms of containing the costs associated with unemployment. Having workers locked out of the production process because there are not enough private jobs being generated is not only irrational in terms of lost income but also causes society additional problems, such as rising crime rates. Direct job creation has been a very effective way of attenuating these costs while the private sector regained its optimism. In fact, it took about 50 years or so after the Great Depression for governments to abandon this way of thinking. Now we tolerate high levels of unemployment without a clear understanding of the magnitude of costs that that policy position imposes on specific individuals and society in general. The neo-liberal publicity machine has been running full bore for a few decades now to convince us that unemployment is not a major issue that should be addressed. Rather, they say it is an optimal choice made by individuals about their time allocation. Students leave universities with this notion etched in their minds. Of-course, what the neo-liberals don’t admit is that they understand Marxian analysis in the sense that they know a reserve army of idle labour allows firms to suppress labour costs. The problem is that full employment is actually better for profits than having mass unemployment. That reality has seemingly escaped the ideological zealots in their feverish campaigns to tilt the playing ground firmly in favour of capital. They actually have got it wrong on both accounts! I invite you to read this blog – What causes mass unemployment? – for more on this debate. The upshot is that the single most rational thing a government can do is to ensure that there are enough jobs to match the available labour force. Mostly, they fail badly to achieve this level of sophistication. These costs are enormous and dwarf the measures that various governments have come up with to estimate losses arising from so-called microeconomic inefficiencies (such as transport systems not running on time etc). Please read my blog – The daily losses from unemployment – for more discussion on this point. However, if you examine the public debate in most nations at present you will read more on a daily basis about the public debt crisis (which is exactly?) 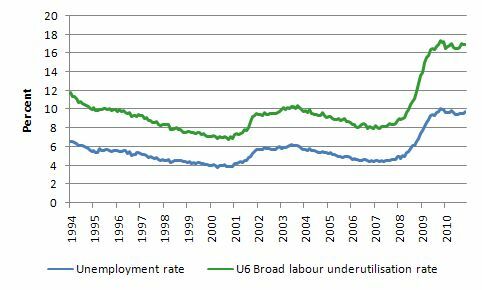 and the need for fiscal austerity than you will read articles calibrating these daily losses from labour underutilisation. I have actually struggled over my professional life to understand how we can be so stupid to accept this silence. Why do we tolerate politicians who abandon a commitment to full employment? Why don’t we demand to know what the Treasury estimates of the losses of unemployment are? In Australia, there has been very little research on this issue – most of it has been done by myself and close colleagues. Anyway, I was interested sometime ago to learn that an American politician – one Dennis Kucinich, a Democrat from Ohio – was introducing a full employment bill – or the National Emergency Employment Defense Act 2010. The press are emphasising the “conservative” nature of Kucinich’s proposal – to wit – that it calls for the abolition of the central bank (The Federal Reserve) and a “return to sound money” (Source). Dennis Kucinich, which many people have (properly) labeled as one step removed from a communist in the past, and who has a reputation as having a hard-core left slant in his politics, has just written up and introduced a bill that will fundamentally restore the free market – for real – to banking and credit … His bill would end the process of money issuance by The US Federal Government as a debt instrument. It would thus restore actual “lawful money” as Ron Paul claims to want, but in a form he has never, ever elucidated. So the right think this is their agenda and that perception is advanced by some of the unnecessary aspects that are in the proposed legislation (for example, the elimination of private credit creation by banks). More about which later. Apparently, the motivation for the bill comes from the American Monetary Institute – see Kucinich on Youtube in this respect. The National Emergency Employment Defense Act of 2010 would allow the federal government to directly fund badly-needed infrastructure repairs and fund education systems nationwide by spending money into circulation without increasing the national debt. The bill would end the current practice of fractional reserve lending, whereby the economy depends upon private financial institutions to lend money into circulation. There are clearly elements about the proposed bill that I like but overall it is misguided not only in its construction of the problem but also in its implementation of the solution. I totally agree that the waste I noted above in terms of unemployment and underemployment is a crime and the US government is now overseeing a failed state of its own making. But we need to be careful about how we understand that policy failure and pick on the right cause and the best solution. Much of Kucinich’s solution is peripheral to the problem and would damage the private sector. I am not an apologist for the private sector but the fact is that the US economy is mixed and heavily private. I understand that and would not advocate conservative deflationary strategies which curtail enterprise. Appropriately regulated private enterprise is a foundation stone for a mixed economy. We can debate whether a mixed economy is necessary but that is the reality we are dealing with in the US. It is a modern monetary system with a strong private component. When you read further you realise Kucinich thinks that the issuance of public debt is “costly” and the “social security retirement system” will present a fiscal headache. Neither proposition is true. I note that things have become worse since the proposed bill was drafted because it says “Nearly 15,000,000 Americans are currently unemployed, another 12,000,000 estimated Americans are underemployed”. As you will see from the November 2010 data above the numbers have grown. The United States is not financially capable of capitalizing on the burgeoning demand for wind, solar and other renewable energy technologies which reduce the cost of energy and help protect the environment, the continued use of non-renewable energies such as coal and oil create a national security crisis as well as long-term economic vulnerability. That is a totally erroneous assertion. The US government could purchase any of these technologies if they are for sale in US dollars any time it wanted to. It could employ scientists on US dollar wages or provide research funding to solar scientists in US dollars any time it chose. There is not financial constraint on the US government exploring alternative energy. Yes, the US economy is in recession and these dynamics are typical of such a depressed state. But in a modern monetary system the US government is capable of turning those dynamics and stimulating economic activity. The real problem is a lack of aggregate demand growth. When the private sector is not willing to spend and the external sector is a net drain on aggregate demand then the spending gap has to be filled by government deficits. I generally disagree with that assessment. First, the Congress is dysfunctional for political reasons. The current US government has all the power it needs to advance public purpose. When the Democrats held the majority in both houses it could have expanded the fiscal deficit to the level necessary to support an apropriate level of aggregate demand. It could have changed the legislation governing debt-issuance – which are legacies of the fixed exchange rate, convertible currency system which failed in 1971. The only reason that these voluntary rules governing the way in which the US government spends survive is because the neo-liberal political forces which seek to limit the ambit of the public sector are dominant. Reforming those institutional arrangement would have eliminated the need for “tax revenue” or debt-issuance to be associated with government spending. The intrinsic nature of the fiat monetary system already exist in the US – the opportunities that system presents the US government are just obscured by a range of nonsensical and voluntary constraints. Please read my blog On voluntary constraints that undermine public purpose – for more discussion on this point. Further, the costs in public infrastructure provision are not related to the interest-servicing associated with any public debt issuance. The only costs that matter are the real resources that are used in each project. I would conjecture that with technological change and productivity improvements the real costs of public infrastructure provision have actually fallen over the last decades. Kucinich is thus confusing the budget outlays as costs and ignoring what really matters. The fact that public infrastructure development is poor in the US is a political issue – it has nothing to do with the intrinsic characteristics of the monetary system. Moreover, the failure of the private banking system has arisen not because of the “fractional reserve system” (private bank credit creation) but because the regulators went AWOL and allowed the private market lobby to persuade the legislators that the markets could self-regulate. The crisis is a failure of regulation. A private credit economy can be stable if the regulatory environment is sound and enforced and fiscal policy is properly conducted. I am amazed that Kucinich never really addresses the failure of the US government to use its fiscal authority appropriately. He is keen to blame monetary policy but the real culprit (along with the regulatory failures) is in the way fiscal policy has been abused. I would certainly reform the financial system along the lines that I sketch in these blogs – Operational design arising from modern monetary theory and Asset bubbles and the conduct of banks. But I would not eliminate the private credit creation capacities of the banks. My reforms would make banks act as banks and not act as speculative and shady risk-shifting institutions. I would also make them pay for their mistakes in judgement by appropriate deposit insurance mechanisms. I would never run a system that socialises the losses and privatises the gains. I would privatise all losses and have strong nationalised public banks as the bulwark. Reclaiming the power of the Federal Government to create money, and to spend or lend money into circulation as needed, eliminates the need to treat money as a Federal liability or to pay interest charges on the Nation’s money supply to financial institutions; it also renders unnecessary the undue influence of private financial institutions over public policy. There is no need in a fiat monetary system for the sovereign government to issue any debt. A sovereign government is never revenue constrained because it is the monopoly issuer of the currency. That principle should be the starting point for defining the role of government and its conduct. The issuance of debt in a fiat monetary system has primarily been about interest-rate maintenance (see Deficit spending 101 – Part 1 – Deficit spending 101 – Part 2 – Deficit spending 101 – Part 3) but with central banks now paying interest on excess reserves that function is redundant. The problem of debt issuance, other than all the unproductive “make work” jobs that exist in the “debt management agencies” of government and elsewhere in the bond markets, is that it is a subtle form of corporate welfare. I would eliminate all forms of corporate welfare. This is one of the more shameful forms of hypocracy I hear from the free market lobby. They hate welfare entitlements being made available to the most disadvantaged citizens but scream for government bonds because they know they provide them with a guaranteed annuity and a risk-free asset to price their other “products” off. My point is that if you believe in private entrepreneurship you can hardly justify asking for government support. Please read my blog – Bond markets require larger budget deficits – for more discussion on this point. Finally, eliminating the redundant practice of debt-issuance would abolish the sway (which is mostly political) that the amorphous bond markets have on democractically elected governments. It would separate the deficit debate (and the advantages of running persistent deficits in certain times) from the debt debate, the latter being used by the conservatives to scare the bjesus out of ordinary folk who think that a public debt explosion is always imminent. People of the United States in any way, even through their representatives in Congress. The creation of the central bank in this way was not in the best interests of the US people. The bank under Greenspan particularly, failed to maintain correct oversight of the financial system. They fell prey to the myth perpetuated by the bevy of mainstream economists that the business cycle was dead. Given the overwhelming central bank focus on price stability, and the critical roll of today’s unemployed buffer stocks of unemployed, it is appropriate that the responsibility for the maintenance of the unemployed (or, better still, JG employment) program be placed in the realm of the central bank. The functioning and effectives of the buffer employment stock is critical to its function as a price anchor. Condition and ‘liquidity’ is the key. Just as soggy rotting wool is useless in a wool price stabilisation scheme, labour resources should be nurtured as human capital constitutes the essential investment in future growth and prosperity. There is overwhelming evidence that long-term unemployment generates costs far in excess of the lost output that is sacrificed every day the economy is away from full employment (see Mitchell, 2001). It is clear that the more employable are the unemployed the better the price anchor will function. The central bank is uniquely positioned to bring its research resources to bear on the issue of optimising its price anchor. We are hopeful that this would quickly recognise the obvious – continuous involvement in paid-work provides returns in the form of improved physical and mental health, more stable labour market behaviour, reduced burdens on the criminal justice system, more coherent family histories and useful output, if well managed. This is something at which a central bank should excel. It is also the case the training in a paid-work environment is more effective than contextually isolated training schemes, which have become the fashion under the active labour market programs pursued by governments in all countries over the last two decades. Again, central banks will quickly recognise this and take immediate action to optimise the price stabilising aspects of their price anchor. And any existing central bank worker not required for this important task could be retrained and pursue research towards a cure for cancer or aids or something else. … reassume the powers and responsibilities granted to it by the Constitution. This would allow the US government to achieve the stated aims of the bill articulated above – that is, full employment. He wants the Federal government to use its capacity to spend for wide-scale “public investment in capital infrastructure” and to “incorporate the Federal Reserve System into the Executive Branch under the United States Treasury”. I agree with both of these aspects of the proposed bill. I disagree with that conclusion. It is an unnecessary step. Please read my blog – 100-percent reserve banking and state banks – for more discussion on this point. I could comment further on the draft legislation but I have run out of “blog” time today. The US government could immediately announce that it was prepared to provide a living (minimum) wage to anyone who wanted to work on public projects. The offer would be unconditional and permanent. The US government at present has all the capacity it needs to introduce such a policy. Please read the blogs that result from this search string – Job Guarantee – for more information. That proposal should have been a centrepiece of this proposed bill. I am disappointed that it is not. The problem is political not financial. The same politics will likely undermine Kucinich’s bill although his “sound money” gymnastics are clearly appealing to the T-party set who are on the rise. It is sad that he has included that nonsense in an otherwise sound piece of proposed legislation. It’s great to finally see some aspects of MMT making into US discourse (even if it gets dismissed by the mainstream). Let’s hope it softens them up for more! I’ve been trying to thinking of ways to explain this to people, via metaphor or analogy. Say you encounter a person who steadfastly believes in government surpluses and doesn’t realize the government has infinite money. It occurs to me that it’s very easy to argue that money does nothing when it’s “in the government’s hands”. In other words, stuff only gets done when it enters the private sector – through wages or purchases. I don’t mean this in the breathless “omg governments can’t do anything” sense – rather that only when expending money does that money actually DO anything (or actually exist at all). You could then ask – why “store” it? If you never spend it, why tax it? If you do plan to spend it, why wait? For a rainy day (recession)? If spending could end a recession, could it not also prevent one? Why wait until it’s upon us? A possible metaphor would be that the private sector is a giant, complex machine made of cogs. Money is the lubricant that keeps it running smoothly. No engineer would wait until the gears dry and seize up to “save oil” – you oil the machine regularly to prevent it from clogging up. Otherwise, what’s the point of having the oil in the first place? Also, all the cogs need at least some oil – you can’t let one cog accumulate it all and leave the others dry. Otherwise the whole machine stops. Although the oil might in be in finite supply unlike the fiat currency of a sovereign government. I have a question for Bill. Has he ever presented the ideas of we not being able to spend our future production today to the mainstream ecenomists who have reputation? Who are considered on the top today, their opinions are being respected etc. It seems so simple that any child could understand this. Media dosn’t think or reason they only present opinions like “this smart guy said so” or “according to this professor”. In case ha has, what is the response? “thing are more complicated” etc? That’s an idea you could subsequently introduce – say the oil reservoir is infinite. Going further, talk about savings leakage – it’s like the oil is pooling in the pan at the bottom of the machine, ready for reuse. The more it leaks, the more you need to top things up. Still, you’re right – metaphors are fun but in the end they betray you. Best to be direct. Unemployment causes labor (labour) shortages as the unemployed, and particularly the long term unemployed, have been shown to be permanently out of and a reduction to what businesses considers the available labor force. And they hurt the overall dependency ratio as well as reduce potential output which combine to become at least a mild inflationary force. So looks like the mainstream concept of using higher unemployment for inflation control is backwards? Yes! And there are already papers from mainstream (e.g. ECB, IMF and Phelps himself) saying that NAIRU increases because unemployment increases. So unemployment leads to inflation. What I think may be the biggest mainstream stumbling block to understanding MMT is that no one has confidence in fiscal policy as a tool to manage aggregate demand. Somehow the 1970s shot its credibility, leaving everyone agreed that monetary policy is the only game in town. One important consequence of MMT’s policy prescriptions for the current balance sheet recession is that, if appropriate-sized deficits were run, govt debt/GDP would exceed 100%. Whilst that shouldn’t be alarming as it stands, it is difficult to conceive of how monetary policy would work under such a scenario. Plus, it would mean that the income effect of a rate rise would become more pronounced, making a rate change even less effective as an instrument than it is today. I think people find it pretty unpalatable to hamstring your key demand management tool in this way. So what I think we need is a good narrative of the inflation of the 1970s, which concedes that it wasn’t entirely about oil, but shows how appropriate fiscal policy could have avoided or reduced the inflation of that decade. I also think that we should start talking about setting legal limits to govt spending as a % of GDP, which would obviously change with the regime in power, but which would put the onus on taxes to carry the weight of demand management. This should at least help to separate out the size of the deficit from the size of the state – which most people obviously conflate. Great post. I think we should give Mr. Kucinich an A for effort at least. It is extremely difficult to shed all of the preconceptions/misconceptions we have about monetary and fiscal policy. Maybe we could help him further in his understanding. Bill – I just found out about the Kucinich bill yesterday, and came here to tell you about it. Ooops! Beat me to the punch. For your information, I learned of it thru “Flawed ‘End The Fed’ Bill From Rep. Kucinich Would Give Congress Near Unlimited Power To Print Money” by Mish Shedlock [ http://www.businessinsider.com/dennis-kucinich-end-the-fed-2010-12 ], and of course he did not have nice things to say about it. Still, there was enough in what he said to bead my MMT eye right in, knowing immediately that he had no clue of what he was looking at. Now, Mish is merely a “registered investment advisor representative” for a capital management company, but maybe you could expand your “banned colleges” list to include companies you shouldn’t leave your money with? BTW, it’s a pretty sure bet that Kucinich’s bill was indeed inspired by work from the American Monetary Institute, as he’s been affiliated with them for quite some time. AMI is headed by Stephan Zarlenga, who you can hear in a three part audio interview at Gnostic Media. In Part 1 [ August 30, 2009 | Podcast #041 ], Zarlenga attacks the question, “What is Money?” and I found it to be quite good, and is responsible for my complete appreciation of your claim that in order to really understand macroeconomics, you MUST also understand the monetary system. Also, Kucinich’s Economic Advisor for his 2008 Presidential candidacy was Michael Hudson, who is (or was last time I checked) a contemporary of Randy Wray at UMKC. Michael Hudson (there are two, don’t confuse them) has strong Marxist sympathies, and promotes the view that economics can only be understood with a strong appreciation of its historical development. He has two recent Guns’n’Butter audio interviews (rants, a lot of fun) on the financial crisis, and has advised both Iceland and Latvia on their problems, suggesting strongly to both that they junk their Euro aspirations and neoliberalism. Finally, Kucinich seems “ripe for the picking”. Perhaps he might be interest in talking with you about your full employment ideas and MMT? [HINT] :-) It would be nice to have someone “on the inside” here in the States. That’s very possible. I’m speculating from a position of near ignorance, however Howard Davies did mention last night on one of the news programmes that the small rise in inflation we’re seeing in the UK could be due to the fact that our unemployment rate didn’t go up as high as other countries. Howard suggested that businesses may have been ‘hoarding labour’ throughout the recession. Now we have the thick end of 5 million people without work and we’re short of something like 2 million Full-Time Equivalent positions to handle the underemployment in the economy. At the moment it looks like the UK economy might be price adjusting, rather than quantity adjusting. We shall see. I wish one of the MMT guru’s could reach Kucinich and explain this to him. I have no doubt of his intentions. His track record of fighting for the little guy and opposing big corporations speaks for itself. He’s was even excluded from presidential candidate debates presumably because the huge corporations that own the mainstream media saw him as a threat to their profits. the ‘sure’ way to control the value of the currency is to limit govt spending by limiting prices paid by govt. that’s called spending on a price rule rather than a quantity rule, and can all be found in Bill’s JG literature. and gives its employees and beneficiaries sufficient spending power to do same. aka indexation of one form or another. so you have a choice. if you don’t ‘inflate’ your real terms of trade deteriorate- you have to export more stuff to get the same imports. or, you inflate which keeps your real terms of trade more to your advantage, but can then trigger further crude price hikes. but eventually couldn’t cut any more (for a variety of reasons) and the price collapsed in a flood of excess crude capacity. now it’s payback time. net demand has risen to where the saudis are again the swing producer and set price pretty much anywhere they want. hopefully we have some substitution on the way soon, or it could be very rough sledding for a while. I read the critique of the Kucinich Bill at Billy Blog. I agree with the analysis that the crisis we are facing is political, and that there is a general misunderstanding of how money works in a fiat currency system. The “misunderstanding” is, in my opinion however, not a misunderstanding at all: rather it is a perversion of reality based upon the extraordinarily powerful forces of herding behavior and human irrationality. You can explain what is really happening (reality!) to an individual until you are blue in the face, but if said individual is utterly blinded by illusion and dissonant thinking, all of your efforts will be for nothing. I am reminded of the Star Trek episode (original series) in which the Enterprise goes to “Sandoval’s” planet to check on the crew of a research vessel that landed there three years ago. When they arrive, they find that the research party is fine, but that, due to the intoxicating effects of a plant on the planet, NO research has taken place. AND, any attempt by the Enterprise crew to convince the researchers that they have wasted three years doing nothing is met with first light-hearted rebukes, and later staunch and belligerent rejection. At the end of the episode, Sandoval’s crew is awakened from their somnambulance, and they are horrified at what has happened, and what has NOT happened, during their three years of Unreal thinking. There is so much anger and so much fear and so much mistrust today. The herd is unwilling to hear anything that challenges their anger or that asks them to consider solutions that involve taking at least a small leap of faith vis-a-vis their understanding of money and of debt, etc. NOW, that said…Billy and Warren (apparently) differ on the employment solution, as Billy calls for the government providing government jobs with a “livable” wage, whereas Warren calls for an $8/hour wage for such jobs. This is a critical distinction, because we need to be careful as we define what constitutes a livable wage. There are tens of millions of Americans living in poverty. Poverty, as Gandhi said, “…is the worst form of violence…”. The answer to poverty is NOT, in my opinion, monetary, but skill-oriented. When people employ local skills and are able to nurture comfortable subsistence and local economies, their “income’ becomes a secondary issue. They have food, shelter, community, etc. I know that Warren sees our consumptive economy as being a good thing. I remember clearly, during one interaction, Warren asking me “…what is so bad about consumption? !…” The problem with being the world’s consumer, among other things, is that such a model create a new type of poverty for the “masses”. Millions upon millions of citizens lose touch with their local, productive skill-base. These people become reliant upon spending and mass production and government subsidy in order to survive. The spirit is thus robbed of one of the cornerstones of the healthy human condition: that of feeling, and being, productive. How does MMT approach the issue of poverty, both from a fiscal and from a systemic and holistic view? How would implementation of some of the tenets of MMT not only lower unemployment levels, but also help nurture a national spirit of wealth…regardless of the size of the bank accounts of the citizens in question? The analogy I’ve used to explain the benefits of sovereign deficits is that the classical gold standard functioned well only when the gold mining sector was running optimal *deficits* of gold — Bill’s ‘vertical transactions’ had to start with gold mines and mints, where now he has Treasury and Central Bank. Balanced budget amendments today make about as much sense as instructing the mint to rebury an equal amount of gold as it received in the 1800s. I haven’t found this very helpful with economic novices, but for folks with a good grasp of gold standards, it seems to get their attention. Bill’s point re oil’s finity is important, but fortunately it supports the case for modern (fiat) money. Re the 1970s, Warren’s point re an external monopoly is a good one, but something I have yet to convince any MMT’ers of is that demographics may have played a larger role (with OPEC able to respond most “effectively” due to its monopoly powers?). Most compelling work I’ve found so far is by Diane Macunovich, who has discovered that changes in the share of certain age cohorts can have dramatic effects on macro variables, including inflation and interest rates. There have been precious few changes in age structure as we saw with the baby boomers, who were a nearly global phenomenon. Just consider that in the 1960s in Japan and 1970s in many western countries the young adult cohorts that tend to form households exploded, with a corresponding explosion in numbers of homes, cars, durable goods, energy consumption, etc. That’s about as ‘real’ an economic factor as I can imagine, and it pushed nominal everything significantly higher for awhile, until those same households entered their peak income and saving years. First of all, I am a believer in the possibility of a strong economy with full employment. The actual economic dynamics and political dynamics for this achievement is where I seek more information and certainty. I think many will agree that the obstacles to full employment in the U.S.A. are due to both politics and the ignorance of alternatives. The failure of the full employment economies of the the state capitalist block of the former Soviet Union are cited as warnings against the “socialism” of the individual right to employment. In fact, almost every incursion on the political and economic privileges of the few through popular democratic reforms are characterized as communist, socialist, or anarchist in the United States. As evidence I submit the characterization of Obama himself as a socialist; belief in him as such requires a new definition of the word. The popular democratic elements of the Tea Party, not their astroturf funders, should be welcomed in any popular efforts to attain a full employment economy in the US and should be considered a strength of any viable plan, not a weakness. Thank you for your thoughtful analysis, Bill. That is a truly ludicrous concept – I’m going to have to use that some time! I guess everyone, on some level, knows that governments aren’t fiscally constrained, that they can always print money. Most people are aware of this if you point it out. I understand that “printing money” is a dirty, loaded phrase, but it requires no explanation. The stumbling block is always that borrowing is seen to be ok but if you print just one dollar – instant Zimbabwe! I have yet to figure out a good, simple way of conveying how wrong that is. Another fear I’ve encountered seems to be that it’s “not fair” for the government to just be able to print money. We can’t – why should they be able to? Not sure whether to tackle this from a “we ARE the government” angle or from the fact that it’s not fair for so many people to be unemployed if they don’t. Most people just don’t know or understand private money creation, that private credit-money just comes out of nowhere. I quess they have some sort of fixed money supply in mind that somehow magically circulates efficiently enough. I find it useful in net discussions just to give them link to some good explanatory videos that exist, like money as debt II – promises unleashed. The key point to understand is that paying down debt diminishes money supply. Rest is easy.